DSiWare gets another big batch of budget titles, WiiWare gets Excitebike. Now you can race around Excite Truck's environments with bikes! There's eleven new games this week, but don't get excited right away - five of them are budget DSiWare versions of commercial disaster Electroplankton. WiiWare gets the previously announced Excitebike and two more games, while Virtual Console gets two rather unremarkable games. Excitebike: World Rally is obviously the biggest release this week - developed by Excite Truck and Excitebots developers Monster Games, it's a return to the classic 2D bike racing of the original Excitebike. With a few features from Truck and Bots (changing terrain, anyone? ), online multiplayer and, of course, a track editor, it looks set to improve on the original in every way. It'll cost you 1000 Wii Points and we'll review it soon. Frogger Returns is an updated version of the arcade classic, meaning you must once again avoid cars and crocodiles as you make your way across a road and river to reach your fellow frogs. The developers have thrown in a few new levels and enemies in for good measure, though, and for just 500 Wii Points it's as cheap as can be. The last WiiWare release today is Dragon Master Spell Caster, a game which was announced quite some time ago. The concept sounds similar to the recent DSiWare release Battle of Giants: Dragons - fly around the environment on the back of a dragon and do battle with other dragons. Let's hope it doesn't turn out as mediocre! It costs 500 Wii Points, and naturally we'll be reviewing it within the next few days. DSiWare gets the most this week. Bomberman Blitz is a rather simple version of one of the best multiplayer games ever. It features 8-player action, although this is only possible offline, with 4-player battles online. On top of that, there are no additional modes and items like in the WiiWare version, meaning it feels a bit cut down. It's good, but only if you absolutely must have a portable, online Bomberman - practically every other version is better. It does only cost 500 DSi Points, though. Also announced quite a while ago is a series of small Electroplankton packages. Each of these games gives you one type of Electroplankton to make music with and each having its own unique tones. The five released this week are Trapy, Hanenbow, Rec-Rec, Nanocarp and Beatnes. Each costs just 200 DSi Points, and it will ultimately just come down to which sounds you like the best. We'll review the whole bunch soon. The Virtual Console gets two catch-up releases: Wonder Boy III: The Dragon's Trap is one of the most well-liked games in the Wonder Boy series, but take note - it's already been available on Virtual Console for over two years as its TurboGrafx-16 version, Dragon's Curse. To top it off, Dragon's Curse not only has better graphics and sound, but also has no sprite flicker, something which plagues the Master System version. If you have nostalgia for it or just want to be cheap (after all, TG16 games are 100 Wii Points more) then by all means, get it, but otherwise, we recommend Dragon's Curse. Cybernoid on the C64 is a bit of a weird one. It's classed as a shooter, but plays unlike any other game in the genre. You take control of a ship and must navigate your way through various small rooms, dodging and shooting obstacles with perfect timing to make it through unharmed. It's pretty hard, but if you've got the skills necessary, it can be quite entertaining. Rev up your engines for a huge week at the Wii™ Shop Channel and Nintendo DSi™ Shop, starting with the launch of a pulse-pounding revamp for the WiiWare™ service, Excitebike™: World Rally. For the Nintendo DSiWare service, you'll find five new titles in the mesmerizing Electroplankton™ series – available at just 200 Nintendo DSi Points™ apiece – plus the irresistible multiplayer mayhem of Bomberman Blitz. With two new classic Virtual Console™ offerings to sweeten the selection, there's truly something for everyone to download and enjoy. Description: Prepare to face daredevil jumps, crazy obstacles and other racers in the newest installment in the venerable Excitebike franchise, available exclusively on the WiiWare service. Choose from multiple camera angles as you tilt your way to smooth landings using motion-sensitive controls. Compete in races around the world in four championship circuits. Use Nintendo® Wi-Fi Connection to invite friends to a race. Or if you're feeling brave, take on anyone else looking for a match. Feel like tackling a challenge of your own design? Use the intuitive Track Editor to choose from the available obstacles and put together your dream course, then share courses with friends to see whose creation skills reign supreme. Description: Frogger Returns takes the heart-pounding challenge of arcade Frogger and moves it into the next dimension. Classic top-down 2-D game play is updated with colorful 3-D graphics, a new perspective, new levels, new enemies and game-changing power-ups. A local multiplayer mode lets you race a friend. Description: The Dragon Lords have returned to the magical world of Nakiha, bringing ultimate power to whoever controls them. Choose your champion, then master amazing magic and fierce dragon attacks to defeat the rival Champions and their Dragon Lords. Choose from four different paths and decide the fate of the world in the fantastic story mode. Battle your friends in two-player split-screen arcade mode and tailor your tactics with different dragon and rider combinations, each with its own strengths and weaknesses. Marvel at the effects of mind-blowing spell collisions. Mix spells and unleash their ultimate power. Control your Dragon Lord and crush, bite and burn your way to victory. Description: Bomberman makes his downloadable debut on Nintendo DSiWare with Bomberman Blitz. Dive into a classic multiplayer Bomberman experience with eight-player local or online multiplayer using Nintendo Wi-Fi Connection. Hone your skills and learn the maps, then take the battle online. Change map and item preferences for enhanced customization. Delivering unparalleled multiplayer excitement, Bomberman Blitz lets Nintendo DSi users enjoy the addictive fun of Bomberman anytime, anywhere. Description: Trapy plankton make sounds as they swim over graceful lines made up of linked triangles. The creatures follow the lines you trace along the water. There are six types of Trapy in all, each with a unique color and sound. All Trapy plankton produce different tones depending on the direction they swim. They produce the lowest-pitched sounds when they swim to the right and produce higher-pitched sounds as their path veers to the left. Description: Normally aquatic creatures, Hanenbow sometimes use floating leaves to launch themselves out of the water, creating strange sounds and melodies as they bounce off the leaves. Entire schools of Hanenbow have been known to launch out of the water, one after another. As a leaf is repeatedly hit by flying Hanenbow, it gradually changes color. This also alters the sound made by bouncing Hanenbow. When all the leaves turn red, a flower will bloom. It remains unclear why the Hanenbow display this curious behavior. Description: Rec-Rec are fishlike plankton that feed on sound waves. They absorb sound waves transmitted through water and use them as a form of nutrition. The sound waves that the Rec-Rec eat are then stored inside their bodies until they have been digested. Once the digestion process is complete, they play back the sounds in perfect four-second intervals. While these sounds are playfully emitted, wave patterns can be seen pulsating on their bodies. Rec-Rec always swim side by side in schools of four. When they swim at different speeds, the frequency with which they emit sounds also changes. Description: Nanocarp have very sensitive hearing. Using their two ears to sense vibrations coming through the water, these plankton can distinguish sound quality and frequency. They display very interesting reactions to the sound of humans clapping or breathing. Nanocarp are also excellent swimmers. They have a tendency to swim in formations of 16 and react together when they detect sounds. These plankton emit sounds on their own when they sense waves on the water's surface. When this happens, the pitch of sounds they produce changes depending on where the Nanocarp is located. Description: Beatnes are curious plankton with geometrically shaped heads that form vertical strands like seaweed. Their bodies are made up of eight sections, each featuring a distinctive diamond-shaped tail. The sound of a Beatnes can vary wildly depending on which segment of the body is tapped. However, all of the sounds closely resemble the short-wave and triangular-wave sound effects from a Nintendo Entertainment System™ sound chip. When Beatnes are tapped in time with a rhythm, they continue to repeat the sounds in perfect time for a short period. 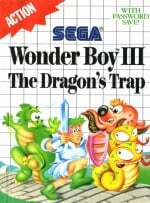 Description: Wonder Boy III: The Dragon's Trap is widely considered to be one of the best games produced for the SEGA MASTER SYSTEM. The direct sequel to Wonder Boy in Monster Land, it starts in the final lair of the previous game. This game is the first in the series to allow Wonder Boy to roam freely by using various animal forms, but as with previous games in the series, Wonder Boy can also buy various weapons, armor and items to help him in his quest. Description: Federation storage depots have been raided by pirates, who've taken valuable minerals, jewels, ammunition and the latest battle weaponry. You have been commissioned by the Federation to retrieve the cargo and return it to storage within a specified time limit. The pirate craft have activated all planetary defense systems, which you must negotiate along with the pirates themselves. If you fail to reach the depot within the time limit, or if the value of your retrieved cargo is insufficient, you must forfeit one of your Cybernoid ships. Didn't expect Excitebike that soon. Definitely getting it. Hope to see Excitebike in Euroland soon! Is Frogger Returns based on that PC game I had? It was 3-D and had a lot of levels, like sewers and jungles and they were big. where the eff is fatal fury special & world heroes 2? Oh yeah, I have had these 1200 points on my account forever now. Not any more! Nice to see such big updates these past couple of weeks. Got to give Nintendo credit for that. I'll likely download Excitebike today, and Frogger sometime later on. I'm glad to see the Electroplankton making their debut too. I can't stress enough just how awful Cybernoid is and I'm a big fan of the C64 from back in the day. Avoid it. It has terrible, unfair gameplay and its only redeeming quality is its music. I may get all three Wiiware releases. Anyone know much about Dragon Master? Still waiting for The Oregon Trail and Castlevania the Adventure Rebirth for WiiWare. On VC, I'm looking forward to Sonic and Knuckles(as I already downloaded the previous 3 Genesis Sonic games), Fatal Fury Special, Earthworm Jim 2, and Kirby Superstar. At least I could enjoy Excitebike: World Rally and Frogger Returns before then. Still no FFII/IV but Excitebike compensates for that. I hope Excitebike comes out soon in Europe. I predict Pilotwings, Shinobi and Solomon's Key will be released in America soon. After those games, well things will probably start to get much more interesting. Nintendo, you be getting all my money. The only intresting game I see is Excitebikes, and I will be buying it sooner or later. Horray for Excite Bike! Boo to pretty much everything else. Two VC games for the third week in a row is good news though. Slowly but surely we are catching up. I think we'll be getting Smash Bros within the next couple of weeks and, hopefully, Cave Story by the end of the year. I expect an excitebike review within 13 minutes. I might get the bomberman game. Electoplankton was dull as a full release so I can't imagine chopping it up will do it any favors. Nothing here for me this week, but seeing the VC get two releases again is good news. "But don't get excited right away"? Why not? Electroplankton is awesome. Beatnes and Trapy are the best and will entertain for a long while, very relaxing. I'll probably pass on the rest. I can't remember what Nanocarp is based on the goofy description. Man, I'd like to get Excitebike for the young'ns, but I'm already stocked up. It's on the wish list. Excitebike and Frogger look good. Lame VC release. Are they going to spoon-feed us all of those C64 releases? Ugh! I'll probably go with Excitebike sooner or later. We didn't get Excitebots. If we don't get Excitebike either I'm going to SULK FOREVER. And send a torrent of whiney e-mails to Monster Games until they give into my demands. Are they going to spoon-feed us all of those C64 releases? Ugh! I reckon so. Slowly but surely. Hey, look - no Cave Story. Pretty good week here, with 2 fairly big WW titles that have come out sooner than expected and 2 VC titles again. I'll be passing on this week's pofferings for now, but that' smostly because I still have some catching up to do. Good to see we are getting 2 VC games a week recently. Still no SSB though! Excite Bike looks awesome so might download that. Was hoping for Castlevania Rebirth and Moonwalker this week. So Electroplankton was a DS beat game? I heard about Electroplankton from that unlockable Smash Bros Brawl Stage for some reason none of my friends want to play on. It is a rather dull stage compared to the other stages you get to fight on in Brawl. Darn, no UNO. But we got Bomberman. I"ll get that soon. That means I only need to get $5 and get the other $5 for when UNO comes. I'll probably cone around and get Excitebike eventually. Oh, look, still no Solitare. Some of the releases for later this month are also known, such as the next Bit Trip. I thought this would be a big month, but I'm also surprised by how many releases there are. I think this must be a fire sale before christmas. Tch. The VC service is getting stupider and stupider. None for me until Nintendo tosses something worthwhile. I'm just shy of one Nintendo point or I'd get ExciteBike World Rally and I don't feel like spending ten bucks right now just to get one more point. The game's not going anywhere so I can just wait a while. Looks like america got good stuff today.i wonder what the EU will get? All right! Excitebike: World Rally here I come! Wow another 2 week VC update! Awesome. Also, even though I'm not a fan, good to see C64 getting some love. I'm really looking forward to some big releases, so it's nice to see we'll be getting to those milestones that many weeks sooner hopefully. I wonder if maybe VC got some more support here in the States all of a sudden, so now they have a bigger backlog? We can only hope. i wonder what the EU will get? That's what I wonder too. There is very little we can catch up on in a normal week outside of a Hanabi Festival even then those games have been released in America ages ago (i.e Axelay). So its got to be something that America has yet to get. I'm so happy that DSiWare has resuscitated Electroplankton, a wonderful little musical toy that never quite got the attention it deserved. Excitebike and Frogger are definitely the best releases this week, I might try both of them, I hope both remakes are great! Look forward to the Excitebike: World Rally review. Frogger looks pretty cool too. Anyone got any Excitebike impressions? There's a game called Dragon Master for the DS in stores, is DMSC a scaled down version of that? A new excitebike game? No way! I wish I could access the Shop. Electroplankton definitely sounds interesting. I always wanted to play it but I never could find the DS game anywhere. 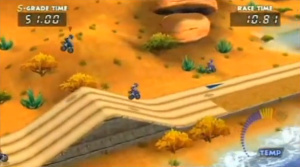 Very nice to see three WiiWare releases today but Excitebike is the only one that I'm interested in. However, the Virtual Console releases for today are extremely disappointing. Am I the only one who's having trouble keeping track of all these Wonder Boy games? I thought we already had this one. I'll be getting the Electroplankton stuff whenever I get my DSi online again. The others...I'll be waiting on reviews. The VC side is weak, but we really struck gold on Wiiware this week! I'm getting Frogger and Excitebike, and maybe Dragon Master if it gets a decent review. And send a torrent of whiney e-mails to Monster Games until they give into my demands. That'll just make them depressed since it isn't their call. Nintendo has to decide. WiiSCU. Look it up on google. I was really happy to get Bomberman Blitz released in Europe. But, dang I want Excitebike & Electroplankton! See, THIS is what I like to see. A lot of releases at a time. Not so high on multi-part games that amount to more than one card worth of expenses released at one time, but whatever. I'll be taking Excitebike, Frogger, Electroplankton, and Bomberman. Good for WW & DSi this week! Yes....yes.......YES! I finally get to play Electroplankton! Sadly, I only have 1300 points, and I'm buying all the Electroplankton. Bomberman, you gotta wait for a points card to show up. There's no reason to avoid the 4.2 update. There wasn't a single member of this site who reported bricking, and from looking around elsewhere on the web (I was very cautious and held off for about 2 weeks), I similarly came up empty on major forums. The original reports were greatly exaggerated; you're about as likely to brick it from this update as you are from some random hardware failure. If I wouldn't already own Electroplakton, I would buy all DSiWare games of the series^^. I think it's unfair to call Electroplankton a commercial disaster. In the US, the game was ONLY available from Nintendo's website and Amazon (same thing in Canada, although the Canadian version of EB Games also carried it). It's hard to call a game a success or failure when the only place to buy it was at 2 websites. As for Wii 4.2, the only reason not to update is if you want to continue using the Homebrew Channel (the update doesn't just disable it, it actually deletes the channel). Weak VC, good DSiWare and WiiWare. ExciteBike and Frogger look great, and Im about to download Bomberman. Decent week. You'll be saying this every week still for the next few months. Same for those who want Cave Story and Castlevania Rebirth/Rondo. @Aquateen510: Would you rather these two VC games had released alone on separate weeks? Give it a few more weeks of two releases becoming standard, and THEN we can complain that both games are "meh." @TJ Spyke: I didn't realize it wasn't available in stores...though I guess that explains why I never saw it in one. I'll probably give Electroplankton a shot at some point, but not right now (need money for other stuff). Excitebike, MAYBE...depending on how the review grabs me. Everything else, I'm not really interested. Still glad for two VC games, though. Keep it up (but with better titles), Nintendo! I might actually get Excitebike. It sounds fun. Boo the fact we got no Heron Steam Machine AGAIN, but those are 3 possible WW titles to pick up if they all get good reviews. I'm most anticipating the Excitebike review, more than likely will be downloading that. Excitebike and Frogger are almost definate downloads if they come our way. I'll be interested in their reviews. Dragon Master's trailer looked awful, let's hope its final release version is an improvement. AGAIN US monday releases get more comments then europe and japan in 1 day. Man no Uno wiiware but i may get Excitebike and Frogger after i buy Pokemon Rumble next week! (possible Uno will be released with Pokemon rumble and ill spend my 2000 pts on those two). What a great week. Too bad I hate Cybernoid. Frogger is very welcome this week though. Dragon Master seems interesting. If it gets a good review, I'll get it next month. I'm currently saving my points for Pokémon Rumble next week. Eleven? Is that the highest number of games we received on a Monday for a long time, or is this a first? Oh, and I'm enamored with ExciteBike, I can't believe there's a WiiWare remake!!! If I was not boycotting WiiWare (and had the Wii Points), I would get Frogger Returns! (and maybe Dragon Master). @Ezekiel: Why comment on the comments? Face it: The North American releases are where it's at, conversationally. Europeans comment because they like to, and all us Americans want to put in our two cents. Americans tend to gloss over the European release list (I rarely post there, and only if they get a HUGE game we don't have yet). A lot of people ignore the Japanese release lists either because they can't download those games anyway or are tired of the jealousy such knowledge invokes in them. @chunky_droid: How about the great Lord Jabu Jabu? Will he do? @StarBoy: I'm pretty sure it's a record for North America. It'd be a bit more impressive if it didn't include FIVE Electroplankton mini-titles, but we'll take what we can get, methinks. Excellent week here (Clap hands). Like I said, don't expect two-game weeks to be standards, but this is indeed good. Lord Jabu Jabu will serve fine Stuffgamer1! Well......... downloaded Bomberman Blitz. What a terrible time to remember I HATE BOMBERMAN. I don't think North America is done with C64 vc releases this month. I also expect another VCA game release this month. 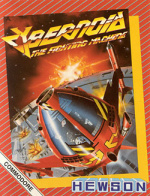 I rather liked both Cybernoid games back in the day, might be different now trying to play them on the remote or classic controller (as you used the number keys to select each weapon on the old breadbin). As for Excitebike, I really hope it's good, will await the review before buying (althoguh I still need to play Nyxquest!). As soon as I got home, I went to the Shop channel, really felt like downloading something new today, after recieving some wii points yesterday . Never liked Excitebike, still waiting for the review, but not a likely DL; Dragon Masters seem good, but I'm not interested; finally Frogger Returns, since I've always love this game, this was my pick (didn't care about the one new VC game; and I already have Dragon's Curse), I liked it, not as good as the first PS1 version, which is my favorite Frogger, but for $5 is OK, very arcadey. Electroplankton on DSiware , man I'm wanting a DSi so badly right now! wow. Just with whats listed as features on Excitebike, it's worth 10 bucks already. It'd take a pretty bad game go wrong with all those features. Awesome! for ten bucks maybe I'll get it so I don't feel bad that I can't afford excitebots right now. Now this is a really good update that i like... time for me to download the Electroplankton games, Bomberman Blitz and Excitebike for the wiiware and play those games too! wooooooo! Your getting some money from me Nintendo! Excitebike is pretty cool. Main mode is rather short (16 courses), but it has tons of replay value thanks to the online (No lag!) and the unlockables. Haven't tried the level editor yet. On comment 82. You nailed that to the teeth. I don't bother with Japan's releases because i went on a jealous rant one time and was put in my place haha. I frankly don't care about Euro releases either. But I've never noticed how many post we get Monday for our American releases. I can almost promise you alot of users will just laugh at my rantings alone (when i'm fed up with shovelware). Maybe we are just more entertaining eh? On the subject I'm interested in Excite Bike, Frogger and Dragon Master Spell Caster (hey that rhymes isn't it a bit corny) this week. I'm a bit disappointed that im not playing cave story right now but that's a small gripe when we get all these gems. Ha ha, ALL of these releases are meaningless to me, because my weekly game purchase is going straight to NSMB Wii which comes out IN FIVE DAYS AND COUNTING. there is NOTHING they could release ww/vc to take away from the excitement. I really wish Excitebike had local multiplayer. Why in the world did the leave that out? I'm going to get it anyway. Probably will download tonight. WHOA. Nintendo really knows what they're doing with the releases now. Woohoo! Dragon's Trap! Downloaded it as soon as I could, and so far, it's been a blast! @Mayhem: Yes, the way you select weapons is a bit fiddly, and it's easy to skip past the one you were going for, not a good thing when you need a particular weapon really fast. I hadn't played Cybernoid before, but I've grown really addicted to it now - just managed to reach the third level after hours of trying. What a masterpiece of a game. So...who actually bought Excitebike: World Rally? When is Pro Wrestling for NES being released?!!!!!!!!!!!!!!! !